Dr. Windom actively serves as an Clinical Professor of Medicine at the University of South Florida, Department of Medicine, Division of Allergy and Immunology. Every other Wednesday morning he travels to Tampa to participate in an educational conference and then supervise the medical students and allergy trainees in the Allergy Clinic at the James A. Haley Veterans Administration Hospital. In 1998-99 he served as President of the Florida Allergy, Asthma and Immunology Society. He is an active member of the American Academy of Allergy, Asthma and Immunology (AAAAI) and now serves on their Board of Directors. Throughout his training at Duke University, Wellington, New Zealand, and Johns Hopkins, Dr. Windom has been actively engaged in medical research. Soon after opening his practice in Sarasota, he jumped back into the research arena with his clinical research center. Dr. Windom is the Medical Director of SARASOTA CLINICAL RESEARCH. The Center conducts clinical drug studies in Dr. Windom’s office both for the advancement of medical science and the opportunity for his patients to have access to new medications (provided free of charge by the pharmaceutical company). If you are interested in participating in a research study with SCR you can learn more on this site or from Dr. Windom and his staff when you visit the office. Dr. Windom has published more than 15 articles in national and international peer-reviewed medical journals. Dr. Windom has presented his research at the American Academy of Allergy, Asthma and Immunology, American College of Allergy, Asthma and Immunology, American Thoracic Society, British Thoracic Society, All Children’s Hospital in St. Petersburg and statewid conferences sponsored by the University of South Florida. He often speaks to local organizations about asthma and allergic diseases. 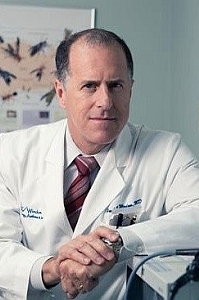 Dr. Windom is a member of the national allergy societies American Academy of Allergy, Asthma and Immunology, American College of Allergy, Asthma and Immunology, Florida Allergy, Asthma and Immunology Society, American Thoracic Society, American Medical Association, Florida Medical Association and Sarasota County Medical Society. Dr. Windom moved to Sarasota in 1960 and attended public schools here, graduating from Riverview High School. He married Anne DePetro from Jamestown, New York and they have four children, Caroline (1990), Porter (1992), Grant (1994), and Reed (2000).